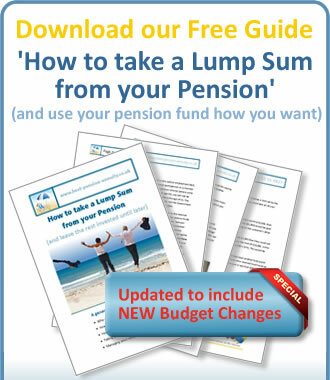 This page is full of information on how to take a Tax Free Lump Sum from your pension. By reading this page you will gain a good knowledge of what needs to be done, if you want to take advantage of your lump sum. If you take a lump sum from your existing pension, your provider is likely to insist that you also take an income. We can offer an alternative whereby you take the lump sum now and an income at a later time. See our FREE Guide, for everything you need to know about taking Tax Free Cash from a pension. We make it easy for you to release a tax free pension lump sum from your fund. We do it by giving you excellent customer service, explaining everything you need to know and doing all the work for you. 'Happy ? - Yes. You said what you were going to do and you did what you said. This service by the internet felt personal, was very good, far exceeded my expectations and was too efficient to be labeled"old fashioned". To encourage future improvement, I have scored 9/10 for your service - but it is hard to see how you could have done better'. Answer the questions below and get an Instant Quote telling you the maximum could take out of your pension fund as a single lump sum or a series of lump sums. We will also tell you how much of this is likely to be Tax Free. Tax Free Cash - What is it ? How Does it Work ? For some people, a cash lump sum could help them achieve a substantial change to their personal circumstances. Many people are aware that they will receive a tax free lump sum when they take their pension. The lump sum is typically 25% of the whole fund value. For example, if their pension fund is worth £150,000, then they could receive a tax free lump sum of £37,500. Many people however are loath to take this lump sum as they believe they will also have to start taking a monthly pension income. Some Pension contracts do insist that you have to take an income if you take your tax free cash, but there are other options open to you. If you are aged 55 and still many years from retirement, taking an income from your pension is unlikely to be a good idea. Changes to the pension rules in April 2006 made it far easier for people to take the lump sum from their pension, while leaving the rest of the pension in place to take later in life when a monthly income does become necessary. To do this a contract called Income Drawdow is used. Despite the name, you don't have to take any income, you can just take your Lump Sum and defer taking an income until another time. If you are aged between 55 and 75, we can help you realise a lump sum from your existing pension fund. A WORD OF WARNING : Your pension is a very valuable asset aimed at providing you with an income when you are no longer working. Once a decision is made to take the benefits (Lump Sum and / or Income) from your pension, it is irreversible. Income Drawdown contracts, which are used for this type of business, are very sophisticated products and carry a significantly higher degree of risk than an annuity contract. We would strongly recommend you only take a lump sum from your pension if it can be used to make a permanent change to your financial circumstances. New cars and holidays may sound attractive, but we would ask you to consider the longer term impact to your lifestyle if you were to use the benefit for such a purchase. Our standard service is to offer Income Drawdown without advice. It is for the customer to decide if the product is appropriate to their needs and circumstances. If you are at all uncertain about income drawdown or if it is appropriate for your needs, we strongly recommend you use our advice service. The most common means of taking a tax free lump sum from your pension fund (but no monthly income) is to use something called an Income Drawdown contract. Unlike an annuity, you do not exchange your pension fund for cash and income. Instead you leave the fund invested and take the tax free cash directly from the fund. The rest of the fund remains invested in exactly the same way as your current pension fund. This means it is exposed to the ups and downs of the investment market. This approach has a number of benefits and some risks, all of which we will explain in the “What you need to decide” section at the bottom of this page. If this all becomes too confusing for you, call us on 020 33 55 4827 and a trained member of our team will give you all the information you need in simple easy to understand language. You may currently have a personal pension, which you may or may not contribute towards. That pension fund is invested in one or more funds of your choice. Hopefully with prudent fund selection over time your pension fund will grow. A drawdown pension contract works in exactly the same way. Things only change when you decide to take your lump sum and / or some income. This is known as “taking benefits” and therefore “putting the pension into Drawdown” or "Crystalising Benefits". At this point you can no longer contribute to this pension contract. However you can contribute to any other pension fund that is not in Drawdown, or crystalised. When you take the benefits from a Drawdown contract, the tax free cash will be taken directly from the fund. 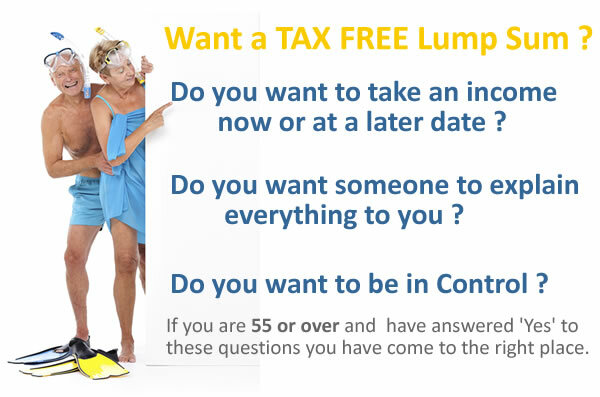 The contract also assumes that you want to take an income, but if you are only interested in your tax free lump sum, you can select to take zero (0%) income. This means that the remainder of your fund remains invested, and so has the potential to grow. If you are interested in taking some income as well as your tax free cash, then please see the Slow Start Annuity page. The concept of leaving your pension fund invested after taking tax free cash can be attractive to many people. There are also significant risks associated with Income Drawdown contracts, which are discussed in more detail below, however you should remember that taking money from any retirement product before retirement can seriously erode your income in retirement. Income Drawdown contracts are very sophisticated products. As standard we provide Income Drawdown without advice. If you are at all uncertain about Income Drawdown if you do not fully understand the various features and risks of the product, we strongly recommend you use our advice service. This chart demonstrates what would happen to a pension fund of £100,000 that was put into drawdown by a customer aged 55 and grows at a rate of 5% per annum. The chart is based on a quote provided by Winterthur (who are part of AXA), it assumes a commission of 1%*, with an annual management charge of 0.5% and a fund management charge of 0.8% per annum. These figures are for illustration purposes only and are not guaranteed. The value of your fund could go down as well as up. If these charges were higher, then the projected growth would be lower. What this demonstrates is that, with a moderate investment performance, the amount taken from the fund over a 10 year period has been replaced. We are not guaranteeing this will happen. Real investment performance could be higher or lower than 5%, lower growth rates would produce a lower fund value. Even in a scenario where investment growth replaces the amount you took an a pension lump sum, you cannot use that growth to take a further lump sum. As you are nearing the point where you need a retirement income you should consider making use of the cash or deposit pension funds which are made available to you by drawdown providers. These funds should give returns similar to bank or building society deposits. While you won’t see exceptional growth it should protect the value of the fund, if there were a stock market crash. If the product charges are higher than the return you got from a cash or deposit fund then the value of your fund would decrease. However many people may consider this a price worth paying to protect the overall value of the fund just before retirement. If while you were in cash or deposit funds there was exceptional stock market growth then likewise, this growth would not be reflected in your fund. After taking your tax free lump sum you can, at any point, start taking income from the fund. You can either do this by drawing it down from the Drawdown pension itself (see slow start annuity), or you can use the whole or part of the fund to take a conventional Pension Annuity. We are also able to offer you a Drawdown contract which would offer you 100% protection of your capital and a guaranteed return if you are willing to leave your fund completely untouched for a set term. The minimum term is three years or you could chose any other term, as long as 20 or 25 years if you wish. For more information and quotes on such a contract please contact us on 020 33 55 4827. Whilst we hope that we have explained this area in detail for you, we do understand that you may want to talk to a real person about this. Please call us on 020 33 55 4827. We will look at your existing pension arrangements and see what options are available to you. It may be that your existing provider will offer you a drawdown option; you may have to transfer; your fund size may exclude certain providers from offering you a drawdown contract. We will provide you with a report on the product you select. This information only report explains the features of your selected product including the associated risks. We provide this information because we want our customers to make an informed decision. We can of course obtain quotes purely based upon the information you provide. In such cases we are sure you understand that we could not be held responsible if you moved away from a pension that offered enhanced rates or other guarantees. We will then need to get an understanding of the features you require from your pension. Obtaining this information from you should not take more than a few minutes. The most important decision you will need to make is whether it is right to take a tax free lump sum from your pension fund before your retirement age. Remember taking money from your pension fund before retirement could seriously erode your income in retirement. This is an irreversible decision, you will not be able to reverse the decision at some later point or take a further tax free lump sum. Once you have made that decision, we are more than willing to help you. There are, of course, a number of benefits and risks in taking this course of action and we will highlight them below. The sum is paid tax free for you to spend as you wish. By keeping your pension invested, you have the opportunity to manage your investment options until you want to purchase an annuity. A good investment strategy could not only replace the amount withdrawn from the fund, but even grow the fund. At the point you want to take an income, you have a number of options, including full or partial pension annuity or taking an income from the Drawdown fund. Even if you don’t want any income at the point you take your lump sum, you could nevertheless take an income and use this monthly income to put into another personal pension. the advantage of this is that a personal pension is more tax efficient if you should die while it is still in place. You also have the potential to take another Tax Free Cash lump sum from funds in the personal pension. If you die while the drawdown contract is in place, the fund will form part of your estate and will pass to your family. Depending on how your family use the fund it could attract a tax liability of 55%. With an Annuity, the fund is lost, and depending on the annuity options you selected your family may not receive any further benefit from it. This may be mitigated to a degree if an annuity with a guaranteed pension or partner’s pension is selected. You can transfer the fund to a standard pension annuity at any point. This could be useful if you feel that you may qualify for an enhanced annuity in the future due to poor health. If you are in a guaranteed product you would lose the guarantee if you left the product before the term of the product had expired. It should be remembered that all financial investment transactions carry various degrees of risk and it is important that you are aware of them. You should only proceed with the transaction if you understand the risks and are happy with them. A pension fund is obviously intended to be used to provide money in your retirement. If you are now taking money from your pension fund before retirement you may seriously erode any income you could expect to receive in retirement. For this reason some drawdown providers will not accept drawdown business if the fund is below a certain amount. The fund in your drawdown contract is subject to investment market fluctuations. If the funds you select do not perform you could find that the residual 75% has shrunk rather than grown. This again could have a negative impact on your retirement income. It should be remembered however, that if your existing pension is also invested in this way, then you are already exposed to this risk. There is a possibility that if you deplete the fund too quickly you could run out of money in retirement. However we would remind you that you can still choose the more conventional annuity route at the time you retire if you wish. It would be prudent to take advice at that time. If you were to die before you converted the drawdown into an annuity, then the fund would pass to your estate. If your partner wanted it as a lump sum it would be taxed at 55%. Your existing pension may have some guarantees built in that you may lose if you transfer into a drawdown contract. You should check this, or authorise us to check on your behalf, before completing the switch. Pension legislation keeps on changing. We have previously seen legislation introduced in 2006 and 2011. Both of these government bills had both positive and negative impacts on income drawdown. At any future point in time a government may again legislate on income drawdown and that legislation may impact negatively upon your plans. The purpose of these notes is not to turn you away from a drawdown solution, but to make you fully aware of all the implications before you make an irreversible decision. Drawdown can be an excellent solution for many people, and we have many clients on our books who have used it to make a major impact on their lives. It is not however an ideal solution for everybody and you must ensure you fully understand all the risks before taking an irreversible decision. If in any doubt whatsoever we strongly recommend you use our advice service.